Arvest Bank is owned and operated by Sam Walton’s son Jim, and the Walton family controls about 96 percent of the company’s stock value. It began in 1965 as a small community bank and grew to include 16 locations in the four states of Arkansas, Missouri, Oklahoma and Kansas. In 2013, it landed a deal to purchase 29 more banks from banking giant Bank of America. Arvest Bank (AB) is a rapidly growing enterprise that prides itself on combining advanced technology with the down-home attitude of smaller banks, such as it once was itself in earlier days. It offers a wide range of services that seek to cater to many needs. 1. Checking Accounts: All of AB’s checking account types require a $50.00 initial deposit to open, but differ greatly in other respects. Free Blue is a no-fee option that has free debit card, online and mobile banking capability, and notary services, along with a few other basic features. For seniors (62 and up), paper checks are free, but shipping charges still apply on them. The next level up is Basic Blue, which adds online bill pay for 50 cents a transaction and increases peripheral benefits such as insurance coverage but adds a $3.00 per month fee. myBlue, Arvest Club, and Preferred Club checking accounts have steadily rising perks with correspondingly rising fees: six, 12, and 18 dollars, respectively. Only the $18.00 fee is avoidable, but it would take a minimal $25,000 transaction that month to get out of paying the fee. 2. Savings Accounts: AB has a special Cool Blue savings program for minors (under 18), which has no fee and even gives clients a membership card, savings register, and complementary piggy bank for free. Clearly this is designed to teach young people to save and to win life-long future clients. Basic Savings earns a smidgen of interest, has a $2.00 monthly fee, and requires a $100 deposit to open. The fee can be escaped by maintaining a $100 minimum or $500 average daily balance. The Money Market account raises interest return slightly, and its $10 fee can be avoided only with a $2,500 balance. A premium interest rate can be had if this account is linked to other AB accounts. The Health Savings Account allows account-holders to avoid paying taxes on qualifying medical expenses, and the CD delivers respectable interest returns for one-month to five-year periods at a $1,000 minimum investment. 3. Credit Cards: Though AB offers numerous credit card deals, the three main ones are: a Visa Platinum with basic benefits, a Visa Gold with higher credit line and lower interest rate, and a Visa or Mastercard Classic Card for all the perks. AB has their own points award system and does not charge an annual fee. 4. Other Services: prepaid and gift cards, Asset management and retirement planning, online support for stock market information and transactions, home, auto, and personal loans, access to foreclosed-on real estate purchases, life, AD&D, and long-term care insurance, roadside assistance and auto repair warranties, and a wide array of other financial services are also offered. The best single point for AB is their no-nonsense, no-charge checking account with all essential services. The fees on higher-level accounts, however, are often inescapable. The specialized savings accounts, like Cool Blue and Health Savings have a niche, but otherwise (as with almost all savings accounts these days), only the CD will yield much return. The credit cards are good in that they have no annual fees, but that is not a rarity. The wide range of services in the areas of loans, investments, etc. allows one to do much of their business in one place. Online and mobile banking services are free for all, whether one has a checking, savings, or other type of account. The locations of the banks in the four AB states of AR, MO, KS, and OK can be found by searching AB’s Branch and ATM online locator. Hours vary from location to location, and the same locator used above also gives access to the lobby and drive-thru hours of each bank. Typical hours, however, are from 8:30 a.m. to 4:30 p.m. Monday through Thursday and till 6:00 p.m. on Friday. ATM’s are normally open till 6:00 p.m. Saturdays and Sundays see a closed lobby and the ATM open only 8:30 a.m. to 6:00 p.m. at some locations. AB’s customer service phone number is (866) 952-9523 and can be accessed from 7:00 a.m. to 8:00 p.m. Monday through Friday and from 8:00 a.m. to 5:00 p.m. on Saturdays. 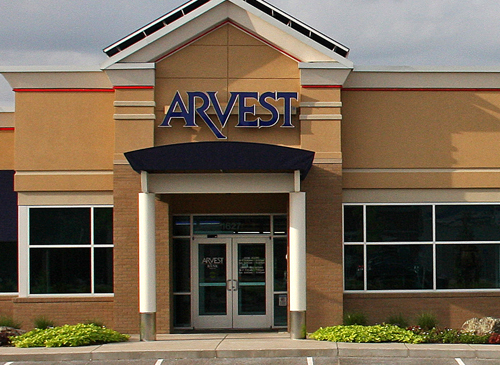 Overall, Arvest Bank offers a wide array of banking products for all kinds of consumers, with a hometown bank feel that many customers appreciate.